People have been wearing jewelry for centuries to enhance their overall look or to make a statement of status. While trends come and go, there are still some basic guidelines that are timeless. One of the most important things to remember is that you need to be aware of what is considered proper attire for each situation and choose your jewelry accordingly. Fashionistas know that accessorizing with jewelry can take an outfit from boring to one that will get you noticed. Just make sure that the attention you're getting is positive. The right accessories will enhance your overall look and provide the fashion statement you want to project, but if you aren't careful, you might cheapen your appearance or distract from your wonderful personality. Many people may claim that "less is more," but isn't always correct. There are some times when you want to wear accessories that sparkle and shine; the key is to know when it's okay. Some pieces of jewelry are perfectly acceptable to wear all the time. For married folks, one such item is the wedding band. If you like to keep track of time, and you prefer not to use your cell phone for that purpose, a wristwatch is always acceptable. A simple keepsake necklace is another jewelry piece that can be worn most of the time. When you choose jewelry to wear to work, select pieces that aren't distracting or noisy. You can still show your individuality, but don't wear anything that might offend the higher-ups or clients. In a conservative office, it's a good idea to stick to stud earrings that complement or match your outfit. In a less conservative office, you can wear stud earrings or small hoops as long as they don't sparkle too brightly or make noise when you move. In a more creative environment, larger earrings are acceptable, but it's still a good idea to select those that aren't noisy, or you'll distract others. You don't want to be that annoying person who jingles and jangles when you walk down the hall. Don't blind your coworkers with extra large rhinestones. Save the flash for after hours. Don't wear noisy bracelets to any type of office. Stacking bangles or bracelets that clang against your desk when you're at the keyboard can annoy the person at the next cubicle or station. When you're not sure if you're wearing too much jewelry to the office, go with the fewest pieces possible. A general rule of thumb is that it's okay to wear a watch or bracelet, a ring, a pair of earrings, and a necklace. Anything more than that is probably too much for most work environments. Save your skulls and skeletons for after work. A formal event is the time to show how elegant you can be, and this is the time to wear your very best jewelry. Although it's acceptable to sparkle all over, it's best to choose one jewelry piece to emphasize your best feature. For example, if you're wearing your hair in an updo, show off your high cheekbones and stunning jawline with some stunning crystal or diamond earrings. A statement necklace can also bring onlookers' eyes up to your face. Remember that jewelry is supposed to accessorize your outfit. Wearing too much of it, even to a formal event, distracts from the overall look. 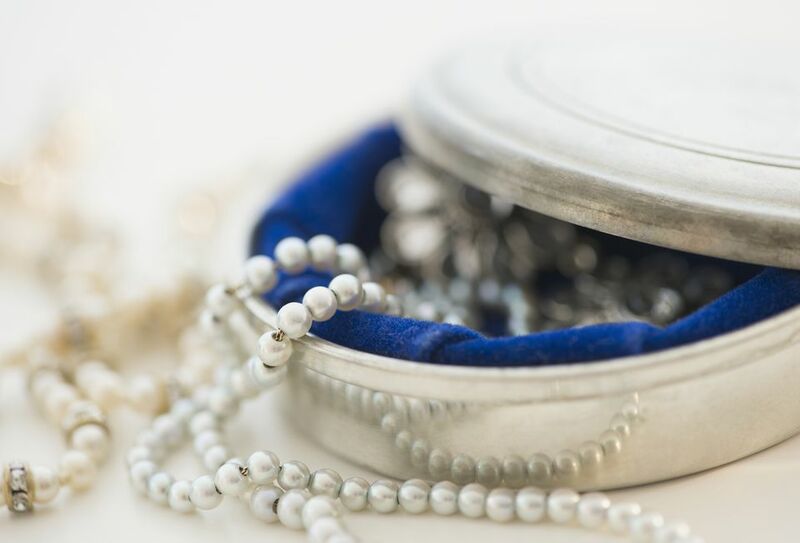 Pull out the pearls, diamonds, and other precious stones to wear to a formal event. Don't overwhelm your appearance with too much jewelry. Don't wear more than one oversized piece, or you'll appear to be playing dress-up with your mother's jewelry. Select one statement piece and downplay the rest of your jewelry. Although it is acceptable to wear a set, be careful not to be too matchy-matchy. When you're going to a friend's party or hanging out with pals on a Friday night, almost anything goes. If you enjoy clanging bangles and blinding bling, this is the time to wear it. Don't forget, though, that too much jewelry will steal the attention away from you, and the accessories will overshadow your great personality. Back in the day, there were so many etiquette rules regarding jewelry, it was intimidating. However, many of those old rules have faded and morphed into something we can easily learn and remember. The old rule about mixing metals is passé. Now you can wear any combination of gold, silver, pewter, copper, and whatever other metals you like. Women were once told that they should never wear a ring on their left ring finger unless it was an engagement ring or wedding band. Now that rule is out the window, and you can wear rings on whatever fingers you want. Once upon a time, it wasn't acceptable to mix real gemstones with faux stones, but now you can mix to your heart's content. And it's nobody's business which pieces are real and which are faux. Matching sets were once all the rage, but in today's world, you don't need to be matchy-matchy. In fact, in many cases, it's better if you're not.